Why does it always seem that just as I have every piece of running gear I could possibly need, the need for something more will invariably crop up? I am an admitted shoe lover (not so much in terms of wanting many pair of shoes, but in having fewer, higher-priced pair...hence my multiple pairs of Dansko clogs), but it's starting to get ridiculous. I have found that after about 250 miles in a pair of running shoes that I start getting aches and pains that weren't previously there. In discussions with other slow, short-strided runners there seems to be a pretty common trend towards retiring shoes with relatively low mileage (most experts recommend replacing shoes every 300-500 miles). The thing we have theorized is that while we may not run as many miles, because we are slow and with small strides we are taking more steps and each foot is spending more time on the ground for the same # of miles. In terms of "hours worn," we are likely spending just as much time in our shoes as our more fleet-footed friends. And that time definitely counts in terms of compression of cushioning materials and wear on outsoles. 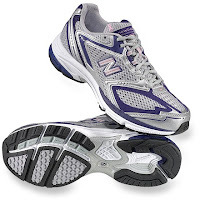 But the other day I discovered something new that has caused me to prematurely retire a $$ pair of shoes (New Balance 1222). After only ~100 miles logged I think I may have to relegate this shoe to yard work or walking--no running. Back around the first of the year I purchased a second pair of shoes (New Balance 767) in an "all-weather" model, that way I would have something to keep my feet warmer and drier for sloppy, snowy Winter runs. Shortly after purchasing these shoes our weather went all to hell. So for the past month+ I have run exclusively in the 767--enough to log ~100 miles. A couple of days ago the roads were fairly clear and it wasn't too cold, so I decided to take my 1222s out for a run. And it felt great for about the first mile...much cushier, as they have a good deal more cushioning than the 767. But they also have a good deal more stability and by mile 2 I was starting to have pains in my lower legs--on both sides. By mile 3 I was considering walking back home and ended up not even logging 4 miles (which is probably just as well, given that I was dealing with a cold virus of some sort, too). The pains by the end of my run were into my knees and starting to radiate into my hips. I think all of this miserable and challenging running I have done in snow has made my legs a lot stronger--as well as the strength-training I have been pretty diligent with for the past month or so. And I think this has likely decreased my stability needs. Running in a shoe without enough stability can cause pain and injury, but so can the reverse. An MD friend of mine who runs said he has a favorite running shoe store reassess his needs every time he needs a new pair of shoes--and he ran 8 marathons last year, so that's a LOT! He believes that even seasoned runners won't always need the same shoe or type of shoe. And given the fact that I am still a "newbie" runner, I guess I'm not all that surprised by my needs changing, either. So I purchased a second pair of the 767 (the ones pictured above). Now I have my original all-weather pair to wear on messy roads and a regular pair for warmer, drier runs. I will probably continue with this model unless I start having issues. At least this shoe is a lot cheaper than the 1222 (by ~$45 full retail), so that's one positive!